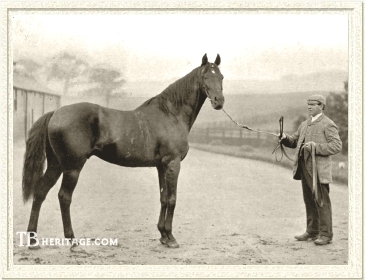 The two names behind the linebred horses are the two most important horses that they themselves were linebred to. And even Man O’ War has St. Simon one time and Galopin two times in his pedigree, Phalaris has St. Simon one time, Selene has St. Simon and Galopin another time again, Teddy has Galopin three times. So is it safe to say that we are very often mostly just going back and back again to the blood of St. Simon/Galopin if we go back to the end of the 19th century? How is it possible then that the phenotype of the Thoroughbred still seems to have changed from that of St. Simon and Galopin? Who seemed to have a higher neck carriage. You could try the following site which is very definitive and informative on Thoroughbred history. I was thinking that maybe Stockwell is the cause, loads of his blood can be found in many TB's and he lived before St. Simon. The change of body type in TB's could ofcourse also be caused by selecting for more speed and less for stamina. Here is a photographic history of some of Danebury Hill's ancestors. Perhaps it can help you. Or is the difference just in fatness, the amount of food they had and how fat they have grown and the difference between being in training and out of training and age?